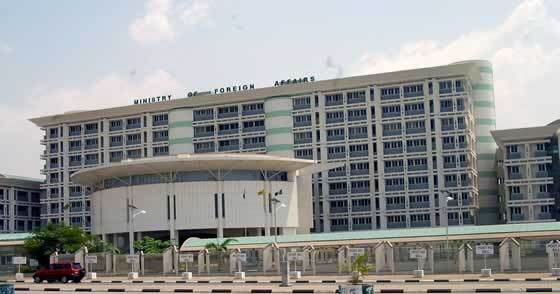 The Nigerian foreign ministry is a statutory body created to handle the external push of Nigeria's domestic vision and ideals; it is headed by the Minister of Foreign Affairs of Nigeria Ambassador Aminu Bashir Wali. As of late its mission has geared towards increasing awareness about Nigeria's economic potential. It is part of the government's executive branch. From 1961 to 1965, Jaja Wachuku was the First substantive Nigerian Minister of Foreign Affairs and Commonwealth Relations, later called External Affairs. Before Wachuku's tenure, Sir Abubakar Tafawa Balewa, the then Prime Minister, doubled as Foreign Affairs advocate of Nigeria from 1960 to 1961 when his government created an official Foreign Affairs and Commonwealth Relations ministerial position in favour of Mr. Wachuku as pioneer Minister. Sir Abubakar Tafawa Balewa set the foundation of the Nigerian foreign policy in his maiden speech to the United Nations General Assembly. The successful prosecution of the Transformation Agenda. 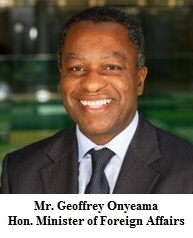 We have continuously projected Nigeria positively, thereby making it more attractive to international investors. Our commitment to strengthening and deepening relations with our traditional friends, while building and cultivating new partnership and alliances around issues vital to Nigeria. Since independence, Nigerian foreign policy has been characterized by a focus on Africa and by attachment to several fundamental principles: African unity and independence; peaceful settlement of disputes; nonalignment and no intentional interference in the internal affairs of other nations; and regional economic cooperation and development. In pursuing the goal of regional economic cooperation and development, Nigeria helped create the Economic Community of West African States (ECOWAS), which seeks to harmonize trade and investment practices for its 15 West African member countries and ultimately to achieve a full customs union. Over the past decade, Nigeria has played a pivotal role in the support of peace in Africa. It has provided the bulk of troops for the UN peacekeeping mission in Sierra Leone (UNAMSIL), the UN Mission in Liberia (UNMIL), and many of the troops to the African Union Mission in Sudan (AMIS). Nigeria has enjoyed generally good relations with its immediate neighbors. A longstanding border dispute with Cameroon over the potentially oil-rich Bakassi Peninsula was addressed by International Court of Justice (ICJ) in The Hague in 2002. 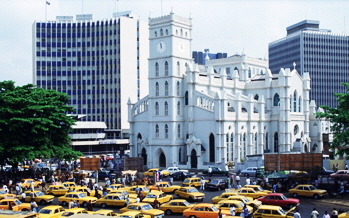 The ICJ awarded most of the disputed Bakassi Peninsula and maritime rights to Cameroon, and the UN established a Mixed Commission on implementing the ICJ ruling. On June 12, 2006 Nigerian President Obasanjo and Cameroonian President Paul Biya signed an agreement in New York on implementing the ICJ decision. Nigeria withdrew its troops within 60 days. On August 14, 2008, Nigeria formally ceded Bakassi to Cameroon. Nigeria is a member of the following international organizations: UN and many of its special and related agencies; World Trade Organization (WTO); International Monetary Fund (IMF); World Bank/IBRD; African Development Bank (AfDB); INTERPOL; Organization of Petroleum Exporting Countries (OPEC); Economic Community of West African States (ECOWAS); African Union (AU); Maritime Organization of West and Central Africa (MOWCA) and several other West African bodies; Commonwealth; Nonaligned Movement (NAM); and Organization of Islamic Cooperation (OIC), among others. DEFENSE AND INTERNATIONAL PEACE AND MILITARY ENGAGEMENTS OF NIGERIA. Active duty personnel in the three Nigerian armed services total approximately 76,000. The Nigerian Army, the largest of the services, has about 60,000 personnel deployed in two mechanized infantry divisions, one composite division (airborne and amphibious), the Lagos Garrison Command (a division-sized unit), and the Abuja-based Brigade of Guards. It has demonstrated its capability to mobilize, deploy, and sustain battalions in support of peacekeeping operations in the former Yugoslavia, Angola, Rwanda, Sierra Leone, Liberia, and Sudan/Darfur. Nigeria currently has about 6,000 peacekeepers deployed in 12 UN missions worldwide. The Nigerian Navy (7,000) is equipped with frigates, fast attack, and coastal patrol boats. The Nigerian Air Force (9,000) flies transport, trainer, helicopter, and fighter aircraft, but most are currently not operational. Nigeria also has pursued a policy of developing domestic military production capabilities. Before the lifting of sanctions by many Western nations, Nigeria had turned to China, Russia, North Korea, and India for the purchase of military equipment and training. Since the restoration of basic democracy in Nigeria in 1999, the bilateral relationship has continued to improve, and cooperation on many important foreign policy goals, such as regional peacekeeping, has been excellent. On April 6, 2010, Secretary of State Hillary Clinton and Nigerian Secretary to the Government of the Federation Yayale Ahmed inaugurated the U.S.-Nigeria Binational Commission, a formalized commitment to hold bilateral talks on four key areas: good governance, transparency, and integrity; energy and investment; Niger Delta and regional security; and agriculture and food security. President Yar'Adua visited President George W. Bush at the White House on December 13, 2007. During her first official trip to Africa, Secretary Clinton visited Nigeria on August 12, 2009. President Jonathan met with President Barack Obama at the White House on June 8, 2011. An estimated one million Nigerians and Nigerian Americans live, study, and work in the United States, while over 25,000 Americans live and work in Nigeria. Democratic and economic progress in Nigeria is challenged by poor governance, entrenched corruption, internal conflict, ineffective service delivery, and pervasive poverty. Nigeria remains mired near the bottom of the United National Development Program (UNDP) human development index. While there has been notable progress in macroeconomic policy reform over the past few years, these reforms have yet to bring measurable improvements to the lives of the people. U.S. assistance aims to help Nigeria address these challenges by fostering transparent and accountable governance; engaging civil society and government partners to battle corruption; increasing professionalism of the military and law enforcement agencies; strengthening health and education systems to deliver quality services; growing the non-oil economy; and improving the environment for regional and international trade. For national and local elections in 2011, efforts also focused on creating an environment for transparent and credible elections. Peace and Security: Prior decades of military rule had a negative effect on the professional development of the Nigerian armed forces. The Nigerian military is still in need of reform efforts to professionalize the officer and noncommissioned officer corps to include a focus on promoting effective civilian oversight and respect for human rights and the rule of law. U. S. assistance continues to provide equipment and training for Nigerian peacekeeping forces, which are deployed to peacekeeping missions throughout the continent. Funding assists in developing the capacity of government institutions and civil society to prevent, manage, and mitigate conflict. The U.S. program also builds Nigeria's capability to address threats to maritime security, including narcotics trafficking, and attempts to improve Nigeria's human rights record and enhance public trust in the security services. Governing justly and Democratically: U.S. funding advances the rule of law by strengthening the capacity and transparency of the justice system and building judicial independence at the federal level. Good governance and anti-corruption reform is enhanced by creating more responsive governance structures at the national and local levels, improving service delivery, and strengthening budget management capacity and fiscal oversight. The United States works directly with a diverse cross-section of Nigerian civil society organizations, building their internal management capacity and strengthening their ability to engage with the government on issues of fiscal accountability, budget monitoring, and extractive industries transparency. To lay the groundwork for elections in 2011, the United States aimed to help build local capacity in managing and coordinating elections infrastructure, and to promote civil society input into electoral and constitutional reform dialogue and oversight of the electoral process. Investing in People: Helping Nigeria address the fundamental health and education needs of its citizens directly impacts governance, stability, and economic growth. Nigeria ranked 70 out of 71 countries in the 2008 Report on the State of the World's Mothers. The national average maternal mortality is about 800 per 100,000 live births, but the rate is at least three times higher in the northern states. Health-care consumers often opt to forego treatment, or to pay for treatment from unskilled providers. Almost one-third of women receive no antenatal care. Sixty-six percent of deliveries take place in the home, with only 35% assisted by trained health care personnel. The United States supports increased access to quality family planning and reproductive health services, focusing efforts in selected states with high unmet demand. Maternal and child health efforts target routine immunization, polio eradication, birth preparedness, and maternity services, seeking to reduce catastrophic rates of maternal and young child mortality. With Nigeria's child malaria mortality burden of over 300,000 preventable deaths per year, U.S. assistance increases access to proven preventive and curative interventions, including insecticide-treated nets, net retreatment kits, and artemisinin combination therapy treatment for children and pregnant women. Nigeria has the largest tuberculosis (TB) burden in Africa. To reduce death and disability, especially in the vulnerable co-infected HIV/AIDS population, U.S. assistance aims to double the case detection rate and halve the incidence of TB over the next 10 years. Funding supports equitable access to quality basic education through teacher training, infrastructure improvement, and community involvement, focusing on public schools as well as Islamiyyah schools that provide both secular and religious education. U.S. assistance fosters higher education partnerships between American and Nigerian universities, focusing on institutions in the north. Through the President's Emergency Plan for AIDS Relief (PEPFAR), Nigeria receives significant support to build partnerships with the host country to provide integrated prevention, care, and treatment programs throughout the country and support orphans and vulnerable children. As a result, in 2007 the World Bank noted that HIV-positive seroprevalence rates decreased to 3.1%. Economic Growth: Funding will build trade and investment capacity and improve the enabling environment for agriculture and microfinance. The United States will continue to implement activities under the Global Food Security Response that will accelerate the uptake of proven production, processing, and marketing technologies, significantly increase the productivity of selected staple food crops, foster agricultural value chain development (to improve production and distribution processes), and stimulate job creation through the growth of agribusiness enterprises. Customs regulation and policy reform will enhance regional trade, transport linkages, and smooth supply to regional markets, ensuring adherence to international standards. U.S. assistance will also focus on expanding investment opportunities, which are hampered by limited access to market-driven commercial financial services, including microfinance. U.S. assistance will also help expand access to credit through partnerships with commercial banks and increased capacity of microfinance institutions. The U.S. will partner with Nigeria's Central Bank to improve the policy environment for micro-, small, and medium-sized enterprises. Ongoing presidential initiatives with Nigeria include the African Growth and Competitiveness Initiative, fighting avian flu, the Initiative to End Hunger in Africa, and the Trans-Sahel Counter-Terrorism Program. Nigeria's eligibility for other regional activities include the Famine Early Warning System; Anti-Corruption Initiative; trafficking in persons; and the Ambassador's Girls Scholarship Fund. Nigeria is a premier participant in PEPFAR, for which about $467 million was committed in FY 2008. Bilateral Economic Cooperation (BEC) focuses on enlarging the development opportunities for the country through Bilateral Economic Cooperation with other counties. This involves economic and social relations with foreign counties and institutions on bilateral basis, i.e on a country or institution basis. This cooperation is carried out through the Bilateral Economic Cooperation Division of the National Planning Commission which identified the followings as germane to the cooperation. Sectoral development including sponsoring of capital projects/programmes in the areas of education, health, power, water resources, science and technology etc both at federal and state level. Nigeria - China Bilateral Economic Cooperation has been in existence for long. The Government of the two nations initiates and implements programmes and projects that enhance and strengthen the existing ties, which also impact positively on the lives of the people of the two countries. The Chinese Government runs capacity building programmes on annual basis to improve the capacity and competence of government officials across the federation. Other areas of Chinese Government interventions include education, water and sanitation, infrastructure etc. Joint/Bilateral Commissions are a convenient legal framework for the negotiation, elaborating and implementation of instruments covering various sectors of activities for the benefit of the nationals or contracting parties. As a joint collaborative action, it is aimed at achieving rapid and sustainable socio-economic development. 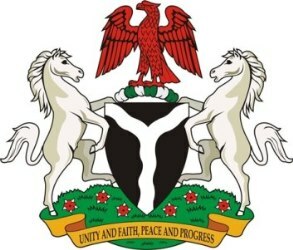 Nigeria has concluded a total of 400 (four hundred) Bilateral/ Joint Commission Agreements in various sectors of the economy and has Joint Commissions with eighty-five countries. While the Ministry of Foreign Affairs provides the focal point for negotiation of these Instruments of Cooperation, National Planning Commission has the statutory mandate of monitoring implementation of Agreements and projects issuing from such bilateral instruments. This is usually achieved through regular inter-ministerial meetings to assess the levels of implementation of the decisions reached at Joint Commissions as well as physical monitoring of related projects to ensure that Nigeria derives maximum benefit from them. In line with its mandate the National Planning Commission has carried out a comprehensive/ critical review of the Bilateral Bi-national Joint Commission. The division also coordinates Nigeria’s economic assistance to sister African countries such as Togo, Liberia, Guinea and Niger through Joint Commissions. Reproductive Health and Rights; Population and Development; and Gender Equality.